Are you a video lover and want to play YouTube videos with screen off? Youtube is the second largest search engine where people publish their videos. A video is more beneficial than an article. So, people use to watch YT more than reading online. The same case also happens with the smartphones users. But, a smartphone user uses the official app to look at the information, because it is more convenient than a browser. YouTube app is available for all major smartphone platforms including Android, iOS, Windows, etc. If you familiar with the YouTube app, then you sure know, as soon as your screen switches off the video pauses automatically in the background. Thre is no direct way to play the video on the lock screen. YouTube has billions of videos including music. But, if you only want to listen to the music instead of watching the video, then you can’t do it. To play YouTube videos with screen off, you need a rooted Android phone with Xposed Firmware installed on it. But rooting and all these geeky stuff are not everyone’s cup of tea. YouTube Red subscription is the only way to play YouTube videos in background without any effort. But, this service is not available for all regions. You have to pay $9.99 for the Android device or $12.99 for your iOS device to enjoy ad-free videos with background play support. Below, I have shown two natural ways to reverse the active screen issues which will also help you save battery while enjoying your favorite music on YouTube. 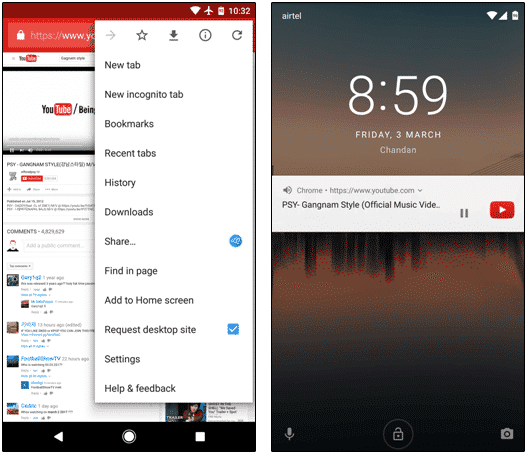 There are three easy ways to play YouTube videos in the background without rooting your Android device. Let’s check it out. Mozilla Firefox is available for all platforms including computers and smartphones. 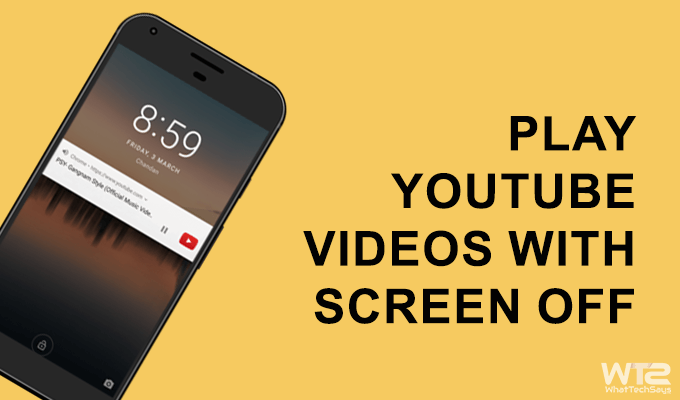 You can access YouTube through the web browser, and the Firefox has the ability to play YouTube videos with screen off on Android and iOS devices. Simply visit the Google play store, download Mozilla Firefox and you are good to go. Firefox mobile browser also supports add-ons, that no browser is supporting now. But, you don’t need any addon. On the YouTube’s website, simply play a video and turn off the screen. Your video will keep playing in the background without any issue. But, the problem is you won’t be able to control the playback from the lock screen. To pause/play a video you have to unlock the screen again. 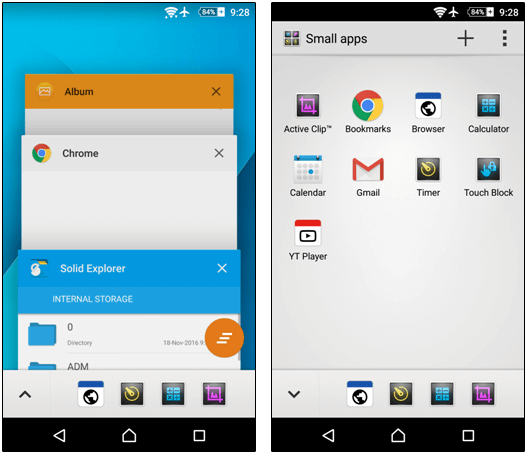 Google Chrome is the default web browser comes with every Android device. You can also use it to play YouTube videos after locking your Android phone. The procedure goes in the same as the Mozilla Firefox, but just with a little bit of difference. Let’s do it. On Google Chrome, open YouTube website. But wait, there is tweak you should apply before turning off your screen. You have to enable “Request desktop site” option to play your videos. To do so, just click on the “three-dot” menu on the top-right corner of the browser and tick on the “Request desktop site” option. Chrome will open the YouTube website like your computer. Now, play any video you want to listen to a music and turn off your smartphone’s screen. That’s it. Then the video will keep playing in the background. The best part of this method is, you can control your video with a play/pause option right on the lock screen. After pressing the lock button, the video will be paused automatically. But, the lock screen will show a YouTube widget with play/pause button. Simply, tap on the button to resume that video. This trick is only for SONY Xperia devices. By using the Small App feature on your device, you can play YouTube videos with screen off. You just need to download and install the “YT Player – Small App” from the play store, and you are ready to go. To do so, tap on the square button (Recent Apps) from the navigation bar and then tap on the arrow button. It’ll show you the list of Small Apps available on your device. To add a new app, just tap on the “+” plus sign and you’ll be taken to the play store. There, you have to install “YT Player” on your device. Follow the above process again to open the Small Apps list and open YT Player. It’ll automatically open the YouTube website in a small widget. Now you can turn off the screen to enjoy a video as music. But, the problem is you can’t control the video right on the lock screen. This small app contains ads, but it is manageable. To play a video from an URL, just tap the three-dot menu on the YT Player and select “Play From URL” option. Now put your own URL and play it in the background. This procedure is super easy on your iOS device. The lock screen feature works perfectly on the Safari browser. So, you don’t need to install any third-party app for this purpose. As like the Mozilla Firefox, simply play a YouTube video on the Safari browser and turn off the screen. That’s it. You’ll also get the play/pause option on the lock screen but in a professional way. You can also do these things by installing Firefox and Chrome on your iOS device. This was the tutorial on how to play YouTube videos with screen off on Android and iOS. I recommend you to use Mozilla Firefox, because it also plays videos in the background while you are using your device. But, chrome and safari pause the video. They only work on the lock screen.